With a General Election imminent, testing social issues are sure to be voiced readily over the coming months in both party manifestos and general public discourse. One topic that will certainly take centre stage in the upcoming debates is the issue of social deprivation and how to best combat economic poverty in a state still recovering from the downturn. Unemployment Trap Owing to the withdrawal of benefits on entry into employment, individuals’ net income is actually higher when unemployed. This is more likely to occur to individuals with larger families, who have adult and child dependent payments withdrawn when entering into the workforce. Likewise, to families with low-income employment. Poverty Trap An increase in gross earnings results in a reduction of net disposable income, as benefits are reduced and costs increase. Benefits such as medical cards are withdrawn, coupled with new work related expenses such as transport costs reducing net disposable income despite an increase in gross earnings. Medical Card Withdrawal Increase in gross income can leave families without medical card provision, resulting in the family as a whole being worse off. The entry into employment of an individual can result in the withdrawal of medical card provision for all members of the family. This is likely to affect low paid employees and larger families the most. High Replacement Rates There is limited incentive to enter into employment, as the net financial benefits of entering into employment are minimal Low paid employment, coupled with the withdrawal of benefits, provides little incentive for entry into the labour market. This is most likely to be true for larger families who would lose the most benefits. Many other disincentives exist, such as the means tested lone parent payments and high marginal tax rates on employment income (a more comprehensive if slightly dated list of disincentives can be found in the 1994 ESRI publication, Analysis of Basic Income Schemes in Ireland). Of course, individuals can be further encouraged to enter employment if benefits currently made available to the unemployed (such as medical card schemes and allowances) are further curtailed, removing some of the ‘incentives’ to remain unemployed. However, in a segment of the population that already lives in poverty, punitive measures curtailing unemployment benefits, while perhaps encouraging individuals into the labour market, is likely to only further increase poverty levels by reducing household incomes of the unemployed or by forcing individuals into poorly paid and insecure employment out of fiscal necessity, leading to a precariat class of the working poor (Standing, 2005). Encouraging individuals into employment without compromising the social protection of the unemployed provides a paradoxical conundrum for targeted, means tested welfare regimes. Several theoretical remedies to this issue have been proposed for the Irish case, including the implementation of a negative tax system that shall be covered in a future article. Another possible remedy is the implementation of a basic income for all citizens of a state, regardless of employment or wealth status. While universal agreement on what constitutes basic income does not exist, most theoretical basic income models advocate that every individual, whether employed or not, receive a basic universal (as opposed to targeted) unconditional tax-free financial benefit paid to individuals (as opposed to households), with all other income sources subject to tax. Depending on the model employed, this could act as an alternative both to social welfare systems and tax credits, where the unemployed would see a basic income replace their social welfare payments, while those in employment would see it replace their tax-free allowances. While critics of such an arrangement are quick to argue that providing a free, unconditional income to individuals would likely only encourage individuals to not actively pursue paid employment (‘why should surfers be fed’ as Van Parijs (1991) put it), proponents argue that the unconditional nature of basic income is actually likely to encourage individuals into the labour market by continuing to provide individuals with financial security, and removing disincentives to enter employment such as loss of benefits (Flaherty, 2015, p. 52). At present, benefits are likely to be lost by the unemployed should they enter employment, but under a basic income model, individuals would be free to take up any employment available, subject to tax at the same levels as other citizens, while continuing to receive the full benefit of basic income. Perhaps the biggest drawback of such a scheme is the seemingly prohibitive costs of providing every citizen with an unconditional income, an income that some proponents argue should be sufficiently large to maintain a sufficiently high quality of life for individuals without further income sources. Such comprehensive schemes are likely to require high income taxation from even the lowest income levels, with some arguing that a high flat tax rate be charged on all earned income in order to finance such a model. One of the models proposed by Van Parijs (2004, p. 32), provides a basic income to all at the level G. Gross income as represented by the dotted line, is shifted upwards by the tax-free basic income. 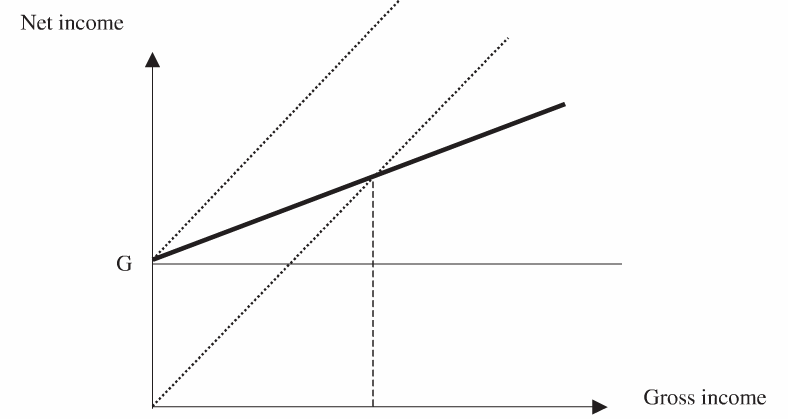 A high flat rate income tax on all other income sources of income, needed to fund the model, leads to the sloping line of net income (bold line). The broken vertical line, where gross income intersects net income, indicated the point where monies received from basic income equal monies paid in tax: those to the left receive more in basic income than they pay in tax, those to the right pay more tax than they receive in basic income. Yet arguments exist that such a model not only reduces the fiscal demands necessitated by means-testing all recipients of benefits as is presently the case in Ireland, but is by itself fiscally prudent where implemented properly. In the Irish scenario, Healy et al. (2013) calculate that expenditure by the Department of Social Protection (DSP) on means-tested welfare payments, the Social Insurance Fund and administration costs in amounted to €20.54 billion in 2011. In their estimation, a basic income to all citizens at levels close to 2013 unemployment benefit levels would cost approximately €38.18 billion (Healy et al., 2013, p. 125). 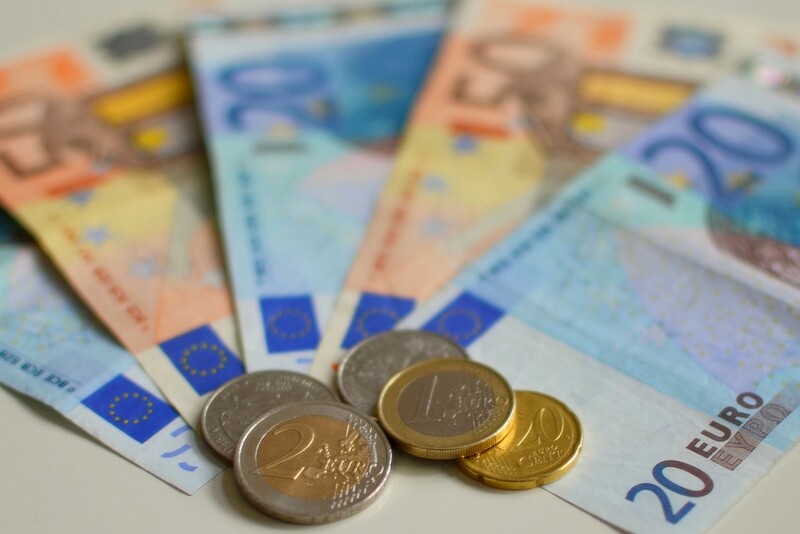 In order to fund the increased costs of such a scheme, a flat income tax rate at 45% of all personal income would bring in €36.04 billion, with a Social Solidarity Fund of employers PRSI covering the shortfall. Intriguingly, the authors argue that such a flat tax rate would actually be lower than the current marginal rate of combined tax, PRSI and universal social charge that amounted in 2013 to a combined figure of 52%, although tax credits in the current system means this percentage is likely to be altered from individual to individual. Surprisingly, basic income has proponents from both the left and right, with neo-conservative commentators such as Milton Friedman and Charles Murray endorsing such schemes that are also being promoted by socialists and social democrats (Wispelaere and Stirton, 2004, p. 271). Yet the principle of basic income is not devoid of criticism. There is a belief among some feminists that basic income will copper fasten gendered work structures, becoming a kind of ‘housewives’ wage or hush money, sending women back home and tempering emancipation’ (Robeyns, 2007, p. 103). While basic income might temper some of the fiscal disadvantages suffered by women not in employment, non-fiscal advantages such as self-esteem, social affirmation and enhanced social contacts could still be lost as a result (Steil, 1997; Robeyns, 2007, p. 105). Yet in societies where unpaid work is at risk of being undervalued, such as household work and care labour, a basic income also serves as a financial valuation of unpaid work, possibly helping to generate increased respect for individuals engaged in such work (Robeyns, 2007, p. 105). Likewise, while some basic income models have shown that women are more likely to want to work fewer hours if basic income was in place, only a small percentage would seek to withdraw entirely from employment if flexible and part-time working arrangements were provided (Késenne, 1990). The benefits of an unconditional basic income to all citizens has many theoretical benefits, and similar systems such as Bolsa Família in Brazil and Oportunidades in Mexico have both had positive impacts in the reduction of income inequalities, illustrating further the potential of such schemes (Warren, 2014, p. 11). Yet the implementation of a basic income scheme in a state like Ireland faces many potential pitfalls. Even the perceived enthusiasm across political divides for basic income, for many its chief selling point, is regarded by the likes of Wispelaere, J. and Stirton (2013) as enthusiasm solely in an abstract ideal, with the debate over how large an income should a basic income constitute likely to drive a wedge between proponents. In an Irish welfare system currently relying on means-testing benefits, restructuring the regime to provide unconditional benefits is likely to generate even more political friction than in more social-democratic European states. Flaherty, C. (2015) Can Basic Income Combat Social Exclusion?, Unpublished Thesis: Lund University. Healy, S., Murphy, M. and Reynolds, B. (2013) ‘Basic income: an instrument for transformation in the twenty-first century’, Irish Journal of Sociology, 21(2), pp. 116–130. Késenne, S. (1990) ‘Basic Income and Female Labour Supply: An Empirical Analysis’. Cahiers Economiques de Bruxelles, 125: 81–92. Robeyns, I. (2007) ‘Will a basic income do justice to women?’ Die Zukunft Sozialer Sicherheit, 102-114. Standing, G. (2002) Beyond the new paternalism: basic security as equality. London; New York: Verso. Steil, J. (1997) Marital Equality. Thousand Oaks: SAGE. Van Parijs, P. (1991) ‘Why Surfers Should be Fed: The Liberal Case for an Unconditional Basic Income’, Philosophy and Public Affairs, 20(2), pp. 101-131. Van Parijs, P. (2004) ‘Basic Income: A Simple and Powerful Idea for the Twenty-first Century’, Politics and Society, 32(1), pp. 7–39. Warren, J. (2014) ‘Can an EU-Wide Basic Income Be Part of the Solution to the Unemployment Crisis’. Working Paper. Wispelaere, J. and Stirton, L. (2004) ‘The Many Faces of Universal Basic Income’, The Political Quarterly, 75(3), pp. 266–274. Wispelaere, J. and Stirton, L. (2013) ‘The Politics of Unconditional Basic Income: Bringing Bureaucracy Back In’, Political Studies, 61(4), pp. 915–932. Previous postThe end of Schengen and the Euro dream? Europe’s crisis of consensus Next postIncome inequality in Capitalist Structures: Live and Let Die?